A lot of businesses tend to think they just need a printer or copier and that they can handle the rest, but there is a lot more to these machines than people think. In fact, when businesses keep the management of their printers to themselves, they can end up missing out. And in some circumstances, they can even be putting their business at risk. First thing, think about who within your business would end up responsible for tending to the needs of your office printers. Nine times out of ten, it’s going to become the responsibility of your internal IT staff. Right away, I would say that internal IT resources are much better spent focusing on network administration and security than they are on caring for office copy machines. Managing office printers includes numerous components. 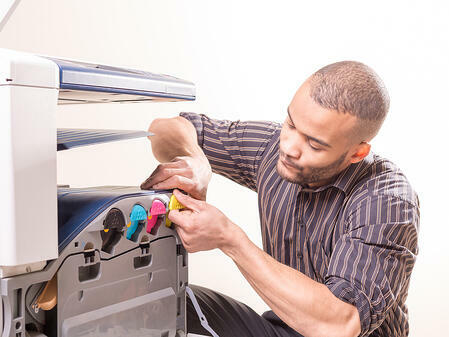 At minimum, printers and copiers need to be supplied, serviced and maintained, but what does that look like in reality? Because copiers and printers do experience issues and break down from time to time, here’s a sample scenario where one of your office printers requires a service. Someone will need to research and diagnose the issue, as well as research and purchase the parts and tools required to fix it. There’s the expense of paying retail for parts and tools as well as the time of your internal employee who’s tasked with handling the repair. If the diagnostic was off and the incorrect part was ordered, there’s also paying to return and restock along with ordering the right part and waiting for it to arrive. Plus, there’s the effort involved in figuring out how to install the part properly. Depending on the issue, other steps may need to be taken to get the printer back into working order and avoiding future glitches, like resetting the counter. If you decide to skip the internal work and hire a repair technician to come in and service the machine, you’ll need to find a technician who works with the brand you’ve purchased, schedule a time for the technician to come in and have an internal employee assist or oversee as needed. Plus, you’ll end up paying a la carte for the service, which doesn’t come cheap. If your business works with Marco for managed print and the office copy machine is malfunctioning, all your internal IT staff need to do is alert us of the issue via email. With that, we’ll be able to dispatch a technician to your location. Our technicians already have the necessary parts, tools and maintenance kits in their vehicles. They can come on site, triage the printer, install the necessary parts, reset the counter and have you back on your normal workflow in a very short window of time. Plus, our technicians know to look if anything else on the printer is compromised, and the entire service comes at no additional expense to you. Instead, the costs are already covered under your managed services agreement. If I had one piece of advice to offer, it would be this: Don’t DIY the management of your office printers and copy machines. Working with a qualified managed print provider is going to take your print environment above and beyond what most business owners think. At Marco, we’re one of the top three managed print providers in the United States, and we’re able to leverage our volume into significant cost savings on all things print-related: machines, parts, toner, tools, you name it. And we’re able to pass those savings onto our clients and customers. Print management is something we do exceptionally well, and we have hundreds of employees with repairing and caring for printers as their area of expertise. We can manage business print environments more cost effectively, more efficiently and at a higher degree of specialization than what’s possible with the internal DIY approach. And we love doing it.